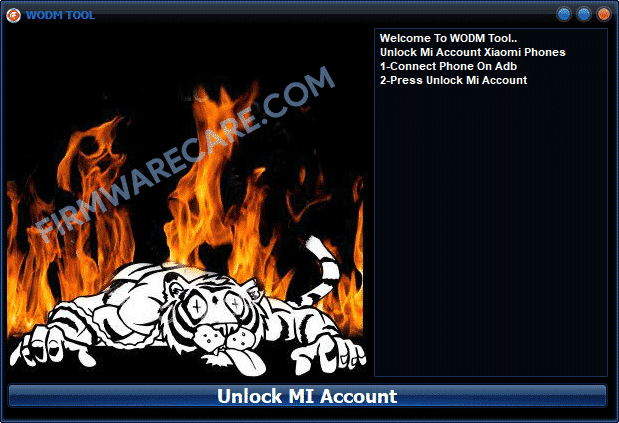 Wodm Tool is a small application for windows computer created by Obeda Kharat, which allows you to remove or bypass Mi account from your Xiaomi Smartphones very quickly with its simple and easy to use graphical user interface which allows you to get your job done in few seconds only. Wodm Tool uses ADB bypass method to bypass the Mi Account from the Xiaomi Smartphones. You just need to connect your device on ADB enabled mode first then Press unlock Mi account in order to remove Mi account from your Xiaomi Smartphones. Wodm Tool supports almost all models of Xiaomi Smartphones. Since, this is an open source tool, you may use it free for always. In order to use the Wodm Application, you need to install the Universal ADB Driver on your computer. [*] Compatibility: The Wodm Application runs perfectly on Windows XP, Windows Vista, Windows 7, Windows 8, Windows 8.1 and Windows 10 (32 bit and 64 bit). [*] Credits: Wodm Tool is created and distributed by Obeda Kharat (developer). So, full credits goes to Obeda Kharat (developer) for sharing the tool for free.